When it is at its best, Firefox is fast. Really, really fast. When things start slowing down, though, using Firefox is much less fun. So, one of main objectives of the developers of Firefox is making sure that Firefox is and remains as smooth and responsive as humanly possible. There is, however, one thing that can slow down Firefox, and that remains out of the control of the developers: add-ons. Good add-ons are extraordinary, but small coding errors – or sometimes necessary hacks – can quickly drive the performance of Firefox into the ground. So, how can an add-on developer (or add-on reviewer) find out whether her add-on is fast? Sadly, not much. Testing certainly helps, and the Profiler is invaluable to help pinpoint a slowdown once it has been noticed, but what about the performance of add-ons in everyday use? What about the experience of users? To solve this issue, we decided to work on a set of tools to help add-on developers and reviewers find out the performance of their add-ons. Oh, and also to let users find out quickly if an add-on is slowing down their everyday experience. 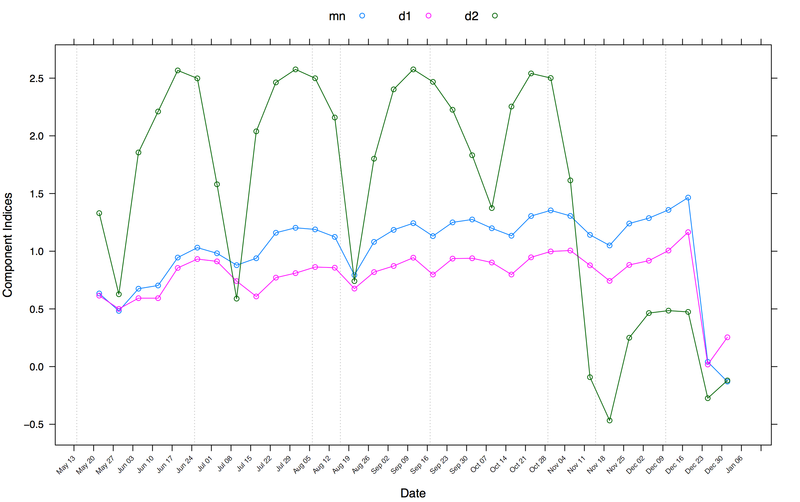 jank, which measures how much the add-on impacts the responsiveness of Firefox. For 60fps performance, jank should always remain ≤ 4. If an add-on regularly causes jank to increase past 6, you should be worried. CPOW aka blocking cross-process communications, which measures how much the add-on is causing Firefox to freeze waiting for a process to respond. Anything above 0 is bad. 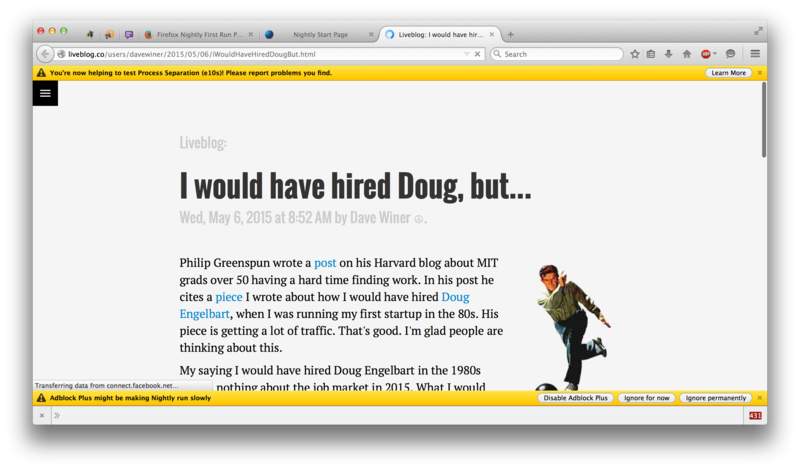 Note that the design of this page is far from stable. I realise it’s not very user-friendly at the moment, so don’t hesitate to file bugs to help us improve it. Also note that, when running with e10s, the page doesn’t display all the useful information. We are working on it. Add-on developers and reviewers can now find information on the performance of their add-ons on a dedicated dashboard. MISBEHAVING_ADDONS_CPOW_TIME_MS, which measure the amount of time spent in CPOW, as detailed above. 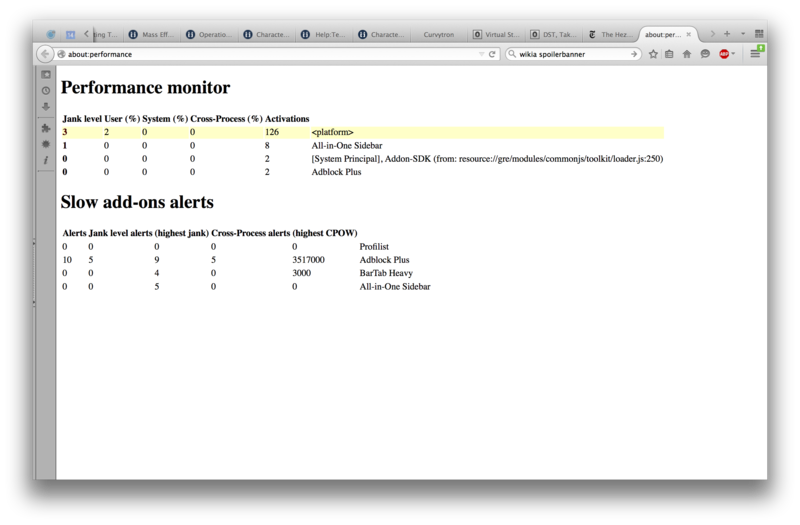 If you are an add-on developer, you should monitor regularly the performance of your add-on on this page. If you notice suspicious values, you should try and find out what causes these performance issues. Don’t hesitate and reach out to us, we will try and help you. Note that this feature is not ready to ride the trains, and we do not have a specific idea of when it will be made available for users of Aurora/DeveloperEdition. This is partly because the UX is not good enough yet, partly because the thresholds will certainly change, and partly because we want to give add-on developers time to fix any issue before the users see a dialog that suggest that an add-on should be uninstalled. For the moment, we are in the process of stabilizing the API, its implementation and its performance. In parallel, we are working on making the UX of about:performance more useful. Once both are done, we are going to proceed with adding more measurements, making the code more e10s-friendly and measuring the performance of webpages. If you are an add-on developer and if you feel that your add-on is tagged as slow by error, or if you have great ideas on how to make this data useful, feel free to ping me, preferably on IRC. You can find me on irc.mozilla.org, channel #developers, where I am Yoric. Vous souhaitez apprendre à développer des Logiciels Libres ? Cette année, la Communauté Mozilla propose à Paris un cycle de Cours/TDs autour du Développement de Logiciels Libres. Pour plus de détails, et pour vous inscrire, tout est ici. Attention, les cours commencent le 8 décembre ! How often has this happened to everyone of us? This scenario has many variants (e.g. module A changed and nobody realized that module B is now in a situation it misuses module A), but they all boil down to the same thing: runtime warnings are designed to be lost, not fixed. To make things worse, many of our warnings are not actionable, simply because we have no way of knowing where they come from – I’m looking at you, Cu.reportError. or for historical reasons (e.g. the now incorrect use of A used to be correct, but we haven’t fixed all tests that depend on it yet). However, I believe that causing test failures is still the solution. We just need a mechanism that supports a form of whitelisting to cope with the aforementioned cases. RuntimeAssert is an experiment at provoding a standard mechanism to replace warnings. I have a prototype implemented as part of bug 1080457. Feedback would be appreciated. when a test suite is not running, a call to `RuntimeAssert` does nothing costly (it may default to PR_LOG or Cu.reportError). in the testsuite, we may whitelist errors by calling Assert.whitelist.expected(keyword, regexp) or Assert.whitelist.FIXME(keyword, regexp). // Rather than leaving this error uncaught, let’s make it actionable. // Whitelisting a RuntimeAssert in a test. // This entire test is about MyModule.oldAPI, warnings are normal. // We haven’t fixed all calls to MyModule2.api2, so they should still warn, but not cause an orange. // In this test, we will trigger a TypeError in MyModule2.api, that’s entirely expected. // Ignore such errors within the (async) scope of this function. In the long-term, I believe that RuntimeAssert (or some other mechanism) should replace almost all our calls to Cu.reportError. deprecation warnings as part of Deprecated.jsm. Plot For the second time, our heroes prepared for battle. The startup of Firefox was too slow and Session Restore was one of the battle fields. backup sessionstore.js in case of startup crash. populate history, scroll position, forms, session cookies, session storage, etc. It is common wisdom that Session Restore must have a large impact on Firefox startup. But before we could minimize this impact, we needed to measure it. When we first set foot on Session Restore territory, the contribution of that module to startup duration was uncharted. This was unsurprising, as this aspect of the Firefox performance effort was still quite young. To this day, we have not finished chartering startup or even Session Restore’s startup. 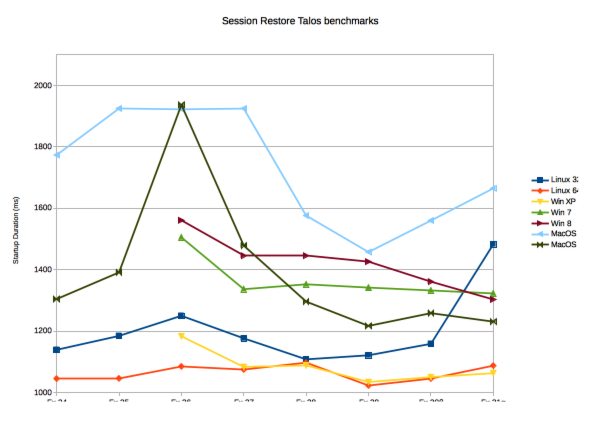 So how do we measure the impact of Session Restore on startup? A first tool we use is Timeline Events, which let us determine how long it takes to reach a specific point of startup. Session Restore has had events `sessionRestoreInitialized` and `sessionRestored` for years. Unfortunately, these events did not tell us much about Session Restore itself. The first serious attempt at measuring the impact of Session Restore on startup Performance was actually not due to the Performance team but rather to the metrics team. Indeed, data obtained through Firefox Health Report participants indicated that something wrong had happened. Indicator `d2` in the graph measures the duration between `firstPaint` (which is the instant at which we start displaying content in our windows) and `sessionRestored` (which is the instant at which we are satisfied that Session Restore has opened its first tab). While this measure is imperfect, the dip was worrying – indeed, it represented startups that lasted several seconds longer than usual. Upon further investigation, we concluded that the performance regression was indeed due to Session Restore. While we had not planned to start optimizing the startup component of Session Restore, this battle was forced upon us. We had to recover from that regression and we had to start monitoring startup much better. A second tool is Telemetry Histograms for measuring duration of individual operations, such as reading sessionstore.js or parsing it. We progressively added measures for most of the operations of Session Restore. While these measures are quite helpful, they are also unfortunately very unstable in real-world conditions, as they are affected both by scheduling (the operations are asynchronous), by the work load of the machine, by the actual contents of sessionstore.js, etc. Difference in colors represent successive versions of Firefox. As we can see, this graph is quite noisy, certainly due to the factors mentioned above (the spikes don’t correspond to any meaningful change in Firefox or Session Restore). Also, we can see a considerable increase in the duration of the read operation. This was quite surprising for us, given that this increase corresponds to the introduction of a much faster, off the main thread, reading and decoding primitive. At the time, we were stymied by this change, which did not correspond to our experience. We have now concluded that by changing the asynchronous operation used to read the file, we have simply changed the scheduling, which makes the operation appear longer, while in practice it simply does not block the rest of the startup from taking place on another thread. This test, based on our Talos benchmark suite, has proved both to be very stable, and to react quickly to patches that affected its performance. It measures the duration between the instant at which we start initializing Session Restore (a new event `sessionRestoreInit`) and the instant at which we start displaying the results (event `sessionRestored`). With these measures at hand, we are now in a much better position to detect performance regressions (or improvements) to Session Restore startup, and to start actually working on optimizing it – we are now preparing to using this suite to experiment with “what if” situations to determine which levers would be most useful for such an optimization work. As we can see, the performance on Linux 32 bits, Windows XP and Mac OS 10.6 is rather decreasing, while the performance on Linux 64 bits, Windows 7 and 8 and MacOS 10.8 is improving. Since the algorithm used by Session Restore upon startup is exactly the same for all platforms, and since “modern” platforms are speeding up while “old” platforms are slowing down, this suggests that the performance changes are not due to changes inside Session Restore. The origin of these changes is unclear. I suspect the influence of newer versions of the compilers or some of the external libraries we use, or perhaps new and improved (for some platforms) gfx. Still, seeing the modern platforms speed up is good news. As of Firefox 31, any change we make that causes a slowdown of Session Restore will cause an immediate alert so that we can react immediately. Our second benchmark measures the time elapsed if the user does not wish windows to be reopened automatically. We still need to read and parse sessionstore.js to find whether it is valid, so as to decide whether we can show the “Restore” button on about:home. We see peaks in Firefox 27 and Firefox 28, as well as a slight decrease of performance on Windows XP and Linux. Again, in the future, we will be able to react better to such regressions. 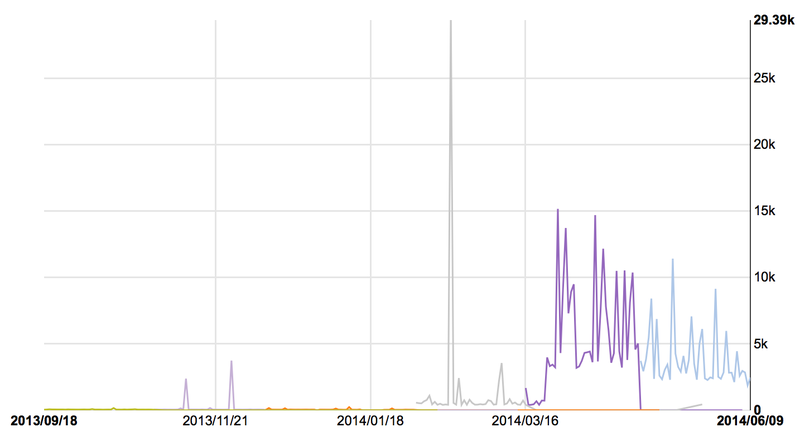 Interestingly, increasing the size of sessionstore.js has apparently no influence on startup duration. Therefore, we do not need to optimize reading and parsing sessionstore.js. Similarly, optimizing history, cookies or form data would not gain us anything. the cost of dealing with windows data, even when we do not restore them. Now that we have information on which parts of Session Restore startup need to be optimized, the next step is to actually optimize them. Stay tuned!